patinated brass oval handles raised on tapering panelled legs with brass caps. 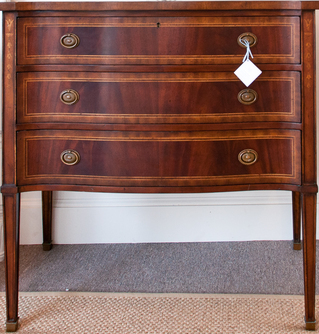 Ideal for an entranceway and as a bedside cabinet. 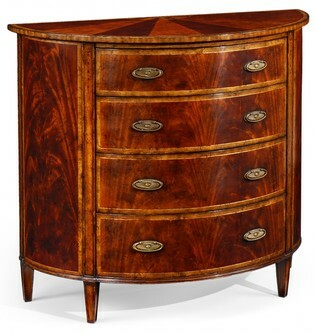 with mahogany veneers to the top and fine marquetry work to the panelled tapering legs. 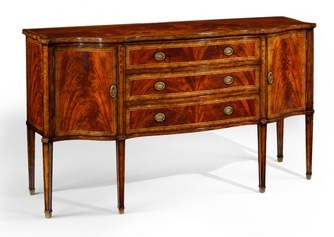 Regency style crotch mahogany veneered sideboard, the breakfront with concave doors to either end, and with three drawers to the center. Patinated brass oval handles, fine marquetry detail to the panelled tapered legs and set on brass feet with square cross section. Third-party logos and marks are registered trademarks of their respective owners.